Key Biscayne, Fla. – March 20, 2017 – Adults and children with minor illnesses and injuries now have a faster, lower-cost option when needing medical care at the new Baptist Health Express Care, located at 240 Crandon Boulevard. The Baptist Health Express Care is open daily from 11 a.m. to 7 p.m. and walk-ins are welcome – no appointment is necessary. Prices of services are provided before treatment. Care is provided by graduate-level advanced registered nurse practitioners, physician assistants and a team of clinical support staff well qualified to treat most minor illnesses and injuries. Residents can call 786-595-8250 for more information. “We were the pioneers in creating urgent care centers nearly 20 years ago. We are confident that our new Express Care center will mirror the same high patient satisfaction,” said Patricia Rosello, CEO, Baptist Outpatient Services. When it’s chest pain or a possible heart attack, severe injury or another life-threatening problem, call 911 or head to the nearest hospital emergency room. “Our team of medical professionals is providing top-quality care for people of all ages who come to us with minor injuries and illness. We welcome all to walk in for a quick diagnosis and walk out in many cases with your medication in hand,” said Luis Bellmas, vice president, Baptist Outpatient Services. 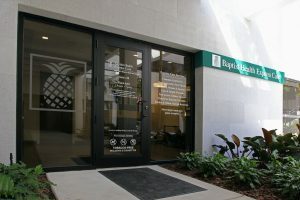 Baptist Health has plans to open additional Express Care locations in the near future in Miami-Dade and Broward counties.